I just heard that actor Jon Locke died on October 9th. While he may not have been a household name, Mr. Locke was a real nice gentleman. I met him at the Memphis Film Festival in 2001. I don't know why I never posted this archived interview with Mr. Locke. This interview is from Entertainment Insiders from August of 2001. Jon Locke was the first person I met at the Memphis Film Festival. I wandered around looking through the dealers booths, checking out the multitude of posters, stills, lobby cards and other memorabilia. 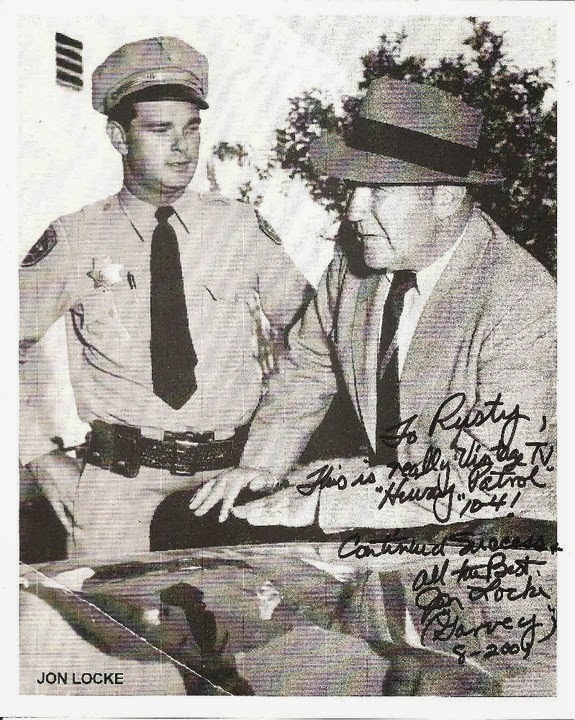 I stopped at a booth and recognized a still from the old TV series "Highway Patrol" with Broderick Crawford. I heard a voice say, "That was real vintage TV. That's Jon Locke with Broderick Crawford." I looked toward the voice and saw a large robust silver-haired man wearing a large black cowboy hat. 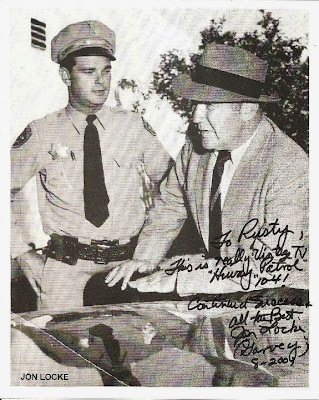 "Oh yeah, "Highway Patrol," I remember it well." "You don’t look old enough" the man said. "It was in reruns when I was young. We used to sit on top of our doghouse and pretend we were Broderick Crawford chasing bad guys" I responded. "That’s me as Officer Garvey. I was Broderick Crawford’s first sidekick." Being the rocket scientist that I am I finally realized that the guy I was talking to was Jon Locke. Like I said before, I’ve never been to one of these conventions before and didn’t expect movie actors to be sitting around talking to anyone who walked up. Jon Locke was a very warm and funny man. He came to Hollywood from Broadway. He appeared in the play "Flame Out." The play was about an Army/Air Force test pilot from Texas. Jon Locke: That was the only Broadway play financed by John Wayne. He never saw the play because he was always away on location making films." Jon also appeared on Broadway and summer stock in "Stalag 17" and "The Pleasure of His Company." Jon left for the West coast. He was hired by Disney to appear in "Westward Ho! The Wagons." From there he moved to TV when he landed the part on "Highway Patrol." John Locke: "Highway Patrol" was a great training ground for an actor. Broderick Crawford was known to like his vodka. If you did a scene before lunch everything was all right. After lunch, things were different. I had to be perfect every time. You never could tell if Broderick was going to blow his lines. I became a good one-take actor. The above comment about Mr. Crawford was spoken with affection. 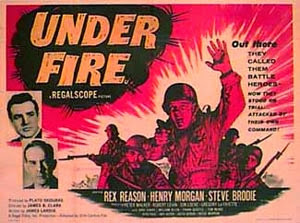 During this same time in his career, Jon appeared in the WWII/courtroom drama "Under Fire" (1957) with Harry Morgan and (in an early role) George Chakiris. Jon appeared as Corporal Crocker, one of four men charged with misbehavior in the face of the enemy. The film was shown at the festival. Jon was quite good in the large supporting role. The film did suffer from an overly dramatic performance by Steve Brodie as the defense attorney. The film’s producer Plato Skouris, came in the last day and watched the film with Jon, Katie and the fans. Who is Katie you ask? Katie West is Jon’s agent, manager, partner and companion. Ms. West is also a celebrated Western Artist who paints in several mediums, and also produces Petrigraphs which are etched into polished granite. Her artwork may be viewed at "www.katiewestart.com". In addition to her painting, she accompanies the musical Mr. Locke on a percussion device named "Ernie." Jon and Katie broke into musical numbers at the drop of a hat. With Jon strumming his banjo and singing, Katie drummed along on "Ernie" a washboard, cowbell, tambourine and several other item contraption which provided an incredible sound. When I saw her first sit behind "Ernie" and play, I was reminded of the "Our Gang" episode in which the Little Rascals entered a musical contest with a bunch of funky homemade instruments. They were laughed at by the other contestants until they started playing. I am a frustrated drummer. I could have a lot of fun with a device like "Ernie." Jon began making TV westerns during the 60s. This was his favorite period of his career. Jon appeared in "Gunsmoke" "Alias Smith and Jones" Bonanza" "Wells Fargo" "Virginian" "Wagon Train" "Laramie" and "Custer" among others. JL: I got typecast because I did a pretty good cowboy. After that I couldn’t get parts outside of westerns. I auditioned for "Ironside." No deal. Kind of funny as I started out on TV as a cop. I also appeared with James Drury’s (the star of "Virginian") rodeo. He called me up one day and asked if I would like to go to Vietnam as part of a USO show. I said "When do we leave?" We had a stop in Japan. Did a show there. NBC sent over an episode of "Virginian" to be used for publicity on Japanese TV. In that episode I played a cruel prison guard who beat the daylights out of Robert Redford. The show was dubbed and shown on TV in Tokyo. I got a kick out of seeing my mouth move and find that I spoke fluent Japanese. In the 70s Jon was able to break free of the western typecasting. He appeared in many other TV series such as "Simon and Simon" "The Waltons" "The Mary Tyler Moore Show" "General Hospital" and "The Bionic Woman" to name a few. He also appeared in the Emmy Award winning TV movie "Gideon’s Trumpet" with Henry Fonda. JL: It was the story of a guy who was railroaded into prison and fought back. Heck, you’re the lawyer, you know that. (Gideon v. Wainwright was the Supreme Court case which said that the accused has the right to counsel in a state criminal case.) Henry was in a lot of pain during the shoot. He wouldn’t let on that he was sick. A real professional. It was an inspiration to see him push himself the way he did. I played a sympathetic guard who tried to help him out in the prison. I had four scenes with him. Two of them were just scenes in which I was there. But I did have two scenes with him that were quite good. I’m proud of that work. I was happy with the way the film turned out. Jon would be recognizable to many who grew up on Saturday morning television in the mid 70s if it weren’t for the fact that he was covered in a large green rubber suite. Jon was the leader of the Sleestacks on Sid and Marty Kroft’s "Land of the Lost." He also appeared as a Yeti in a couple of episodes. JL: I was the only Scotch-Irish yeti on television. They couldn’t hide my Irish nose under the make-up. I’m Scotch Irish! That means I like to drink, but I don’t like to pay. Another film that Jon is proud of is "Years of the Beast," a Christian end-times movies that IMDB calls "one of the best Christian end times films…"
JL: The movie was filmed during a strike. We had a SAG educational exception permit. It had a great cast. Jerry Houser (Summer of '42) was in it. We had a union crew, great production values. I played one of the leads. I was a survivalist. It was set in the Northwest. The movie had great production values and surprisingly good special effects as they destroyed Seattle in the movie. There was a doctor in Canada who was a devout Mennonite. He was a pilot who took a lot of time off to fly to Alaska as a missionary. Against his kids wishes he put up $450,000.00 for this movie. He’s passed on now, but his movie lives on. EInsiders.com: So what do you have cooking for the future? EInsiders.com: What about Jerome Arizona. That is such a cool place? JL: Actually the first episode was about Jerome. They had a different host. He didn't work out and the story was dry. The producers revamped the whole idea, they hired me. I'm also helping my friend reorganize the Western Film and Art festival to be held next year in Sedona Arizona. On the last day of the festival, Jon took part in a recreation of an episode of the radio version of "Gunsmoke." He played Matt Dillon. No one else there could have done it as well. I must admit that I did not know Jon Locke by name before the festival. I have seen him in many shows, but I never put a name to the face. I was able to spend many hours with Jon and Katie. They are gracious and talented people. I hope to see them next May at the Western Film Festival in Sedona Arizona. Check out Jon’s filmography on IMDB and look for his work at you local video store. Long time "Video Risk" sponsors "The Video Library" and "Hollywood’s Attic" would be another good source to locate Mr. Locke’s film work.